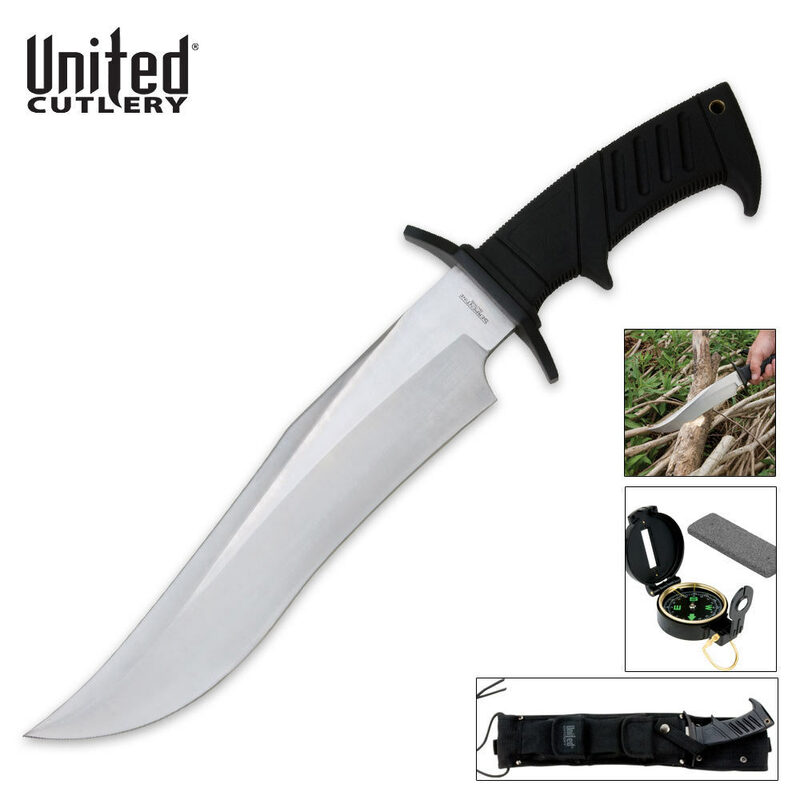 United Cutlery Serpentine Survival Bowie Knife & Sheath | BUDK.com - Knives & Swords At The Lowest Prices! The Serpentine Bowie from United Cutlery is what you'll find in the dictionary under beefy. 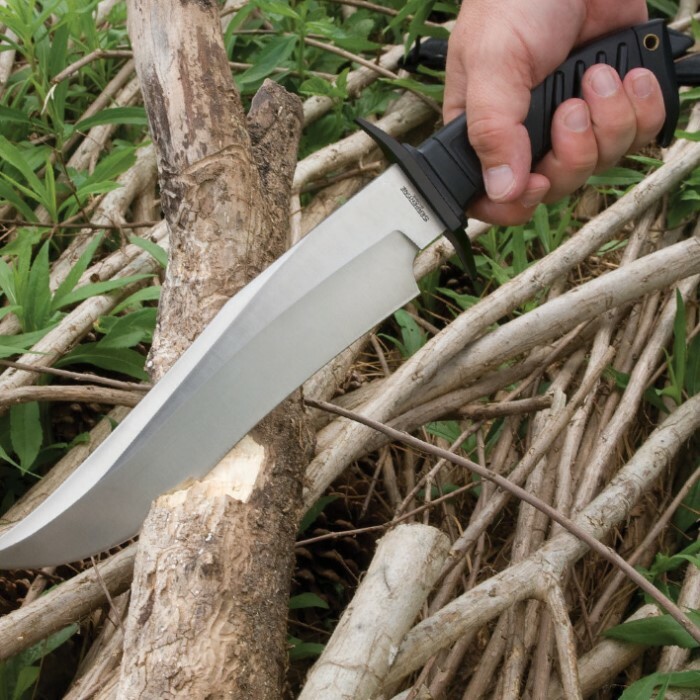 It's a knife that every animal in the jungle fears with its powerful CR17 stainless steel full-tang blade. Stay away from any and everything made by united cutlery. Their stuff is meant for wall hanging. The cheap handle came off the blade after 3 swings. Ridiculous. This should have been a free knife due to the quality. Spend the extra money and buy something of quality. D**n this is big. I received my knife today and I am totally blown away. It is not only sharp but it feels bigger in my hand than in the pick's.LOL. BudK "ROCKS'. The sheath if really nice. The compas is really good and it does have a nice sharpening stone for out in the field. I already have the knife attached to my bug out bag. You definately will not go wrong purchasing this knife. Thanks BudK! This knife makes a nice companion for my Schrade Bolo. Nice quality. Excellent sheath. The compass is good quality and the military style I am familiar with. Knife was dull out of the box but it took a good edge. Well built. Get one! Shot a huge hog during the week, did not have a axe on hand, by chance took the new knife with me, used it as an axe, worked perfect!!! Awesome Product! Let me say this :o Omg I recently bought the TURTLEMAN bowie from another site and I thought it would be tough to beat. This is very close. This one is a little longer and the molle sheath is a little nicer but the handle just feels a little weird. I'm sure with some use my comfort level will grow. plain and simple this is a monster of a blade and should probably be classified as a short sword. Great buy worth twice as much. You don't realize how big 10 1/2 inches is until you hold this in your hands. This knife is huge, The Sheath that you get with it is actually not bad for what you would normally get at this price range. The compass is a generic compass and the sharpening stone maybe a bit to small for this knife, honestly though i haven't even used it because i have a knife sharpener. not a bad blade the metal isnt my favorite but i dont mind. this knife is huge! i have fun with it chopped down a tree or two.good goof around knife to have. its just great. blade is kinda big, but sheath is nice.